This is a fun dish to play around with and make your own. There are many ways you could spin it: adding a little more cheese here or there, using oregano instead of basil, substituting cottage cheese for the ricotta, etc. It makes a lot so be prepared to send a pan to the neighbors or invite friends over. I promise it will satisfy! Note: You can make this up to a day in advance and refrigerate it. Bake when ready. Preheat oven to 375 degrees F. Lightly spray a 9x13 and a 9x9 inch pan with cooking spray (I use an olive oil cooking spray).Place all the spinach in a medium size skillet. Drizzle 1-2 tablespoons water (not listed above) over spinach. Cook over medium heat until the leaves are just wilted, about 2-3 minutes, use tongs to toss so the leaves wilt evenly. Transfer the wilted spinach to a sieve to drain. Squeeze dry when cooled off and chop finely. While chopping I try and pick out the majority of the spinach stems (personal preference). In a medium bowl, combine the spinach, garlic, ricotta, mozzarella, egg, basil, salt and pepper. Mix well. Cook the shells in a large pot of salted boiling water. Cook them until they are just shy of al dente (you don’t want them getting too mushy when they finish baking in the oven). Drain the shells then transfer them to a bowl. Toss with the olive oil to keep them from sticking together. Put a light layer of tomato sauce on the bottom of each pan. 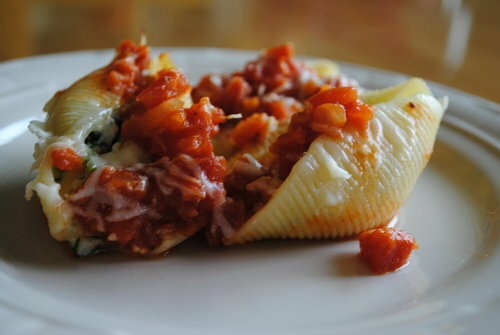 Fill each shell with a heaping tablespoon of the ricotta-spinach mixture. 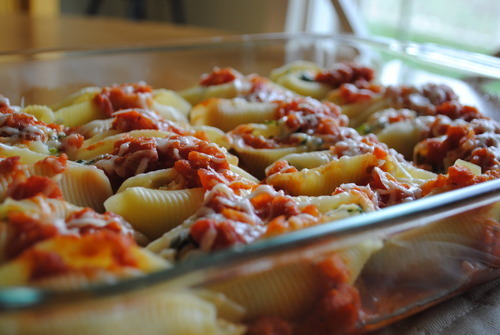 Arrange the shells in a single layer in both your baking dishes. 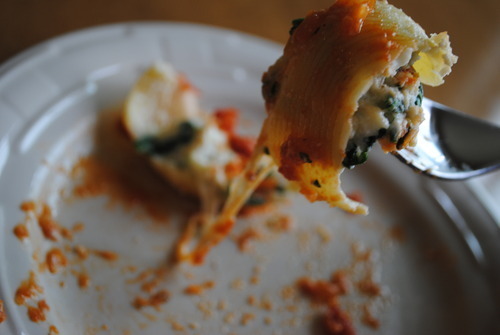 Spoon the remaining sauce over and around the shells. Sprinkle the grated romano cheese over the top. Foil and bake until hot and bubbly. 30-40 minutes.